As a South Asian bride, it is your birthright to adorn yourself with the most extravagant jewels on your wedding day. Anything less would just be a waste of time, not to mention, take away some of the most fun and girly moments of your wedding preparations! As a South Asian bride, it is your birthright to adorn yourself with the most extravagant jewels on your wedding day. Anything less would just be a waste of time, not to mention, take away some of the most fun and girly moments of your wedding preparations! Whether you are Hindu, Christian, Sikh or Muslim, the bride often wears a variety of accessories before and after marriage, making the giving and wearing of jewelry one of the most complex and time-honored processes of marriage. In fact ours is the only culture to attach so much significance to our bridal jewelry. Traditionally, bridal jewelry entailed wearing cumbersome ornate gold items. But today that standard has relaxed, meaning that brides have access to a plethora of stunning pieces of different colors, shapes and textures. It all looks pretty enough that brides enter upon the full works without really knowing why. Before they know it, the idea of parading about in every single beautiful piece, each weighing almost a ton starts to daunt them. So to make it a little easier on yourself, it is well worth reading up on why we wear them and what jeweled item goes where and how. Thankfully for you, we have put it all together to ensure that whether your bridal look is radiantly traditional or laced with a more westernized theme, the jewelry you wear will proudly proclaim it. The tikka is normally clipped onto the head’s crown with a chain ending in the shape of a delicate symbol that dangles neatly on the forehead. Hair is usually styled with a middle parting to keep the tikka in place. This item is one of the most attractive items of bridal jewelry and is often seen as an extravagant version of the bindi. Today they come in all sorts of designs that are embellished with a variety of precious and semi precious stones. The jhummar is a jeweled hair ornament that hangs over one side of the head. Often worn in accompaniment to the tikka, the pendant’s design is often more elaborate and showy as it serves to compliment the face. But be sure that its shape is similar to the tikka to make the look more uniform. This is an elaborate hair accessory that takes part of its shape from the tikka and the jhummar. In its most simplest of forms, the sahara has a central piece running down the head’s center with an attachment on either side that runs along the front part of the hairline and clipped into the sides. But today the sahara can have many strands that run from the center, with beads hanging off them. The nath is a nosepiece in the shape of a ring with a chain, which normally hooks onto the ear. Traditionally a bride, who doesn’t have her nose pierced, would be obliged to have it done especially for the wedding. Thankfully for those dead set against the pain of piercing their noses times have changed where jewelers are creating painless pieces, that can be conveniently clipped inside the nostril – it’s as easy as that! The earrings tend to be quite large, usually made of heavy gold accompanied by an adornment of precious stones. Another popular type of earring is the jhumka, which is bell-shapedand made of solid gold. If you are sensitive when it comes to heavy earrings sometimes they are attached to a string of pearls which can be held behind the ear lobe to support the weight and allow you to continue to look impressively elegant in manner and extravagant in taste. The pancha is a bracelet with up to five chains running down the back of the hand ending in rings. These days, with convenience playing a big factor, many brides opt to wear a pancha with just one ring, as it looks more elegant as well as a little more manageable. Better known as bangles, the kangaan has become the most desired item of Indian jewelry to make an impact among our western contemporaries. These bangles come in a variety of colors mostly made of glass and tend to be worn not just by the bride but also by most of the women on auspicious occasions like a wedding. Many modern bangles have been turned into bracelets, made of gold and in some cases studded with precious stones. They are sold in sets of 24 but the gold bracelets can be worn individually depending on the desired look. The ring is not solely an Indian tradition; it is the most traditional and well-recognized form of wedding jewelry in any culture. The continuous circle is a symbol of continuous and never-ending love and fidelity. If your wedding is all about going traditional, you might want to consider wearing an arsi, a lavish thumb ring with a mirrored front. Suffice to say it is not one for modern service, but it exudes exotic antiquity that would sway any traditional brides. The kalireh is one of the items with a deeper meaning. It consists of a variety of bracelets, which have decorated coconut shapes and metal pieces hanging off them. 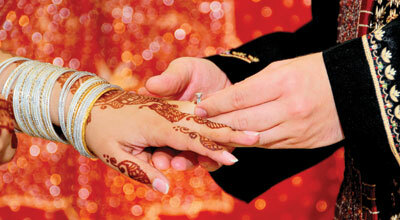 It is meant to symbolize the bride traveling to the new marital home. The coconuts show that her stomach will never be empty and the jewels symbolize that she will always have money for herself. The churha is a set of dozen bangles in both red and cream given to the bride by her uncles. Tradition says that they should be worn for as long as possible but the bride may remove them three days after the wedding if desired. or ‘thread of goodwill’ which can be seen as an additional representative of the marriage union to the ring. It is usually a chain of black beads strung onto a black thread along with a gold pendant. Many women feel that there is a lot of prestige attached to the offering of the mangalsutra as it represents the love offered to them by their husbands. The black beads are seen to protect against evil, and so due to this significance, the mangalsutra remains the one piece that has not been changed by modern trends. As the bride tends to be bare foot during the ceremony, the most popular item of jewelry worn is the payaal, a delicate anklet sometimes set with a variety of spherical balls that jingle with every movement. However small rings can be worn around the toes known as bichua. These are silver and joined to the payaal with a chain. advice When you walk into a jewelry store, you are guaranteed to be dazzled. But bear in mind that the pieces are strategically placed on deep velvet to enhance their color and softly bath in light to add a sparkle and gleam the piece simply does not possess. To get a good idea of any piece you buy, insist on handling all jewelry and inspect them in natural light to see how they look against your skin. It is always a good idea to take a swatch of your wedding outfit to see how well they offset against them. Your jewelry should always complement your over all look. Just because a family member has given you jewelry as a gift if it does not match your outfit or make-up – think twice before you wear them. Needless to say that you have to be politically correct too.